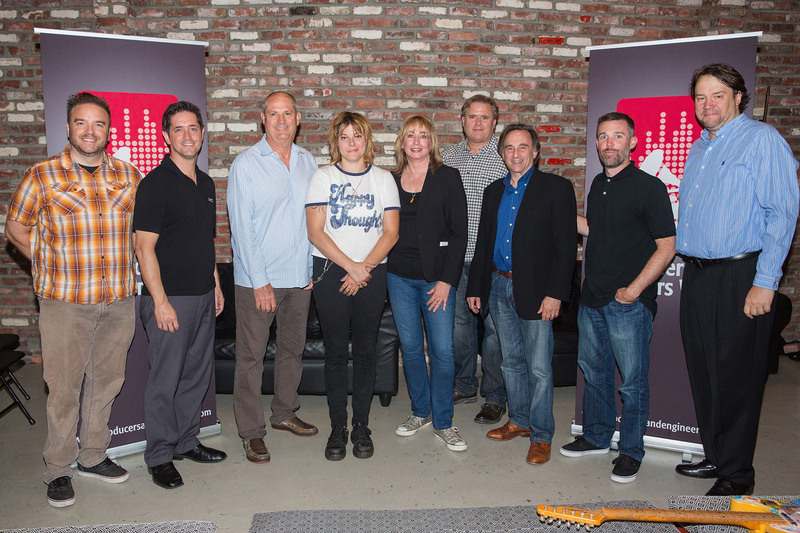 Santa Monica, Calif. (August 19, 2015) — On Tuesday, July 14, 2015, The Recording Academy® Producers & Engineers Wing® and Pacific Northwest Chapter, along with HARMAN® Professional, hosted "From Mic to Mix" at Seattle's London Bridge Studios. The evening event highlighted the latest recording technologies from HARMAN Professional brands AKG®, dbx®, JBL Professional® and Lexicon® in a real-time recording application featuring producer Mike Clink (Aerosmith, Guns N' Roses, Megadeth), and acclaimed Seattle-based singer/songwriter Star Anna. A series of professional development events designed to showcase the production and engineering crafts along with products and technologies used during the recording process, "From Mic to Mix" events have become a highlight of the Producers & Engineers Wing/HARMAN Professional partnership. Sessions are hosted by top studios and have featured local talent from the Los Angeles, Miami, Nashville and Pacific Northwest Recording Academy chapters. Attendees experience initial pre-production planning, room setup and mic placement, the live tracking process and basic mixing. The events each conclude with a short Q&A that allows talent to elaborate on their workflow and creative processes. Attendees also enjoy networking and interaction with audio experts from the HARMAN brands who share details about new HARMAN products and technologies. The Los Angeles event featured two-time GRAMMY®-winning engineer Nathaniel Kunkel and local L.A. indie band The Big Bang! at Hollywood’s famed Conway Recording Studios. The Miami session showcased Latin GRAMMY-nominated artist Aymee Nuviola and her 11-piece Cuban band, with GRAMMY-winning engineers Eric Schilling and Carlos Alvarez at the board in Noisematch Studios. At Nashville’s Sound Stage studios, GRAMMY-winning producer/engineer Chuck Ainlay was behind the glass with the acoustic guitar and vocal sounds of the Long Family. "It’s been a great privilege to work on these 'From Mic to Mix' sessions with the amazingly talented artists, producers and engineers from The Recording Academy's different chapters," said Peter Chaikin, Sr. Manager, Recording and Broadcast, JBL Professional. "At HARMAN Professional, we understand the fundamental importance of the recording craft. That's why we work so hard to deliver products of the highest possible quality and performance. Getting out in the field and using those products in real-life recording situations is a great opportunity to both help teach the craft and to learn from the next generation of recording artists. It's also wonderful to experience all of these great studios around the country, and to meet the dedicated people who run them." "We were proud to co-host another successful educational event serving the vibrant Seattle recording community and we are grateful to our HARMAN Professional partners for supporting 'From Mic to Mix,'" stated Maureen Droney, P&E Wing Managing Director. "We thank everyone involved, and we look forward to the next installment in this series."